Two nuns admit stealing half a million dollars - and spending it on travel and gambling. Catherine and Tom discuss the language from this story. 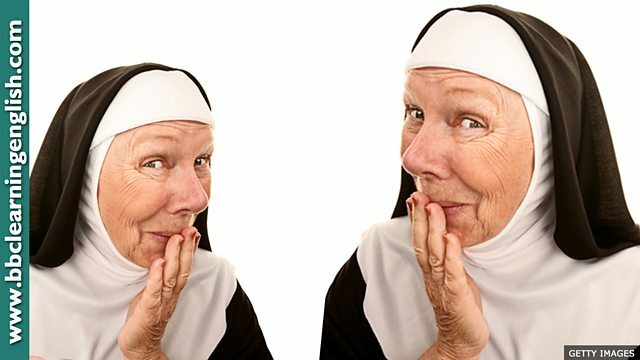 Around half a million dollars was taken from a school by two nuns who worked there. They spent the money on travel and gambling in Las Vegas. This ______ has lived in the convent for years. Two Roman Catholic nuns in California have admitted embezzling about half a million dollars from the school where they worked. Sisters Mary Margaret Kreuper and Lana Chang, described as best friends, are said to have spent the money on travel and gambling in Las Vegas. • Someone has stolen all of the funds we raised over Christmas! • There are several funds you can apply to for financial support whilst studying. • I try to put my children to bed early as they become quite unruly in the evenings. • Some teachers think that violent films can have an unruly influence on teenagers. • My relationship has been unhappy for ages. I think it's inevitable that we will break up. • On a course like this, failure is inevitable if you don't keep up with your work. There are only 2 'e's in this word. It's ______ that my brother and sister end up arguing when we have a family party. They've never got on well. This word means 'badly behaved and difficult to control'. Dimitry was told to leave the class because of his unruly ______. The word 'raise' can mean 'collect' when referring to money. Which noun means 'a person who collects or saves money for a particular purpose'?